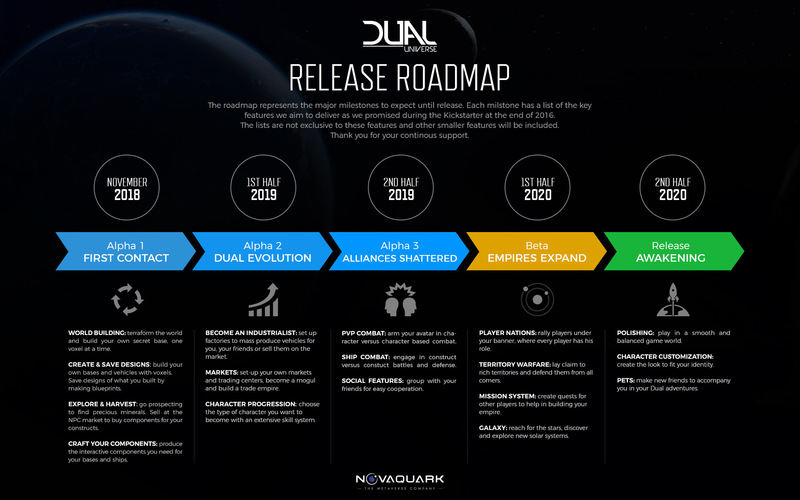 Thursday 29th November 2018, Paris, France – Novaquark, the French studio behind the hugely ambitious PC MMORPG, today announces that Dual Universe has entered its Alpha Stage. This marks the civilization building MMO’s biggest development milestone since its Kickstarter in 2016, offering a truly massive content update. Craft your components: produce the interactive components you need for your bases and ships. Built upon four key pillars – Explore, Build, Trade, Conquer – Dual Universe’s Alpha 1 brings the first three facets of this massive sci-fi sandbox to life, allowing players to explore and build almost anything they can imagine. From subterranean bases and futuristic cityscapes, to spaceships capable of interstellar travel and planet-bound hovercraft, not even the sky’s the limit. Plus, with the launch of Alpha 1, players have a lot more room to create. Thanks to the dev team’s terraforming efforts, Alioth, the game’s starting planet, has reached an area size close to the one of real life Great Britain, and that’s only the first planet. Underpinning the game is Dual Universe’s proprietary technology, which allows millions of players to interact across one continuous shard, meaning that players are not separated by servers, instances or loading time. “With feedback from over 4,000 players, our pre-alpha stage was incredibly successful, and we’re thrilled that we have a core community of players who are as passionate about the game as we are. Whilst we’re still unveiling our alpha at this stage, we’re confident that with our community we’ll continue to grow the game into something truly unique in the MMORPG market,” said JC Bailie, Novaquark CEO. In order to match the words to the vision, Novaquark announced that all Kickstarter backers no matter their amount of pledge will also be able to join the Alpha allowing the game population to reach over 11.000 players before the end of the year. While the Alpha 1 launch is the biggest milestone for Dual Universe, this is only the beginning of the journey. The team shared their vision for the Alpha & Beta development.